Midway01485 534267work Self-cateringVisit England graded 3 star. Duvets. No bed linen/towels (can be hired for £15 PPPW). Elect incl. Freesat TV/video. One well behaved pet. Microwave. Garden furniture. Stair gate. Travel cot/high chair on request. Microwave. £50 breakage dep. 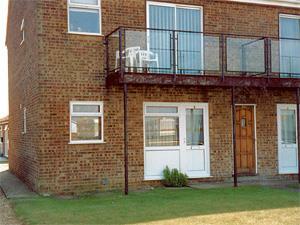 Only 100 yards from the promenade and Hunstanton beach, this ground floor flat (in a block of 4) is ideal for a family seaside holiday. Facing west, the property enjoys beautiful sunsets throughout the year. The town centre is just a minutes’ drive or twenty minutes walk. There is off road parking (one car) and a lawned area for sitting out (not enclosed). Pleasantly and comfortably furnished, with electric heating, comprising; entrance into living room with freesat TV/video, sofa bed, dining table and chairs. Adjoining kitchen to the side, having double electric oven, microwave, fridge with ice compartment. Visit England graded 3 star. Duvets. No bed linen/towels (can be hired for £15 PPPW). Elect incl. Freesat TV/video. One well behaved pet. Microwave. Garden furniture. Stair gate. Travel cot/high chair on request. Microwave. £50 breakage dep. From A149 From 1st roundabout turn left and follow signs to beach. From Kings Lynn on A149 to Hunstanton.